Nothing to buy or bring. Materials provided at no additional charge. 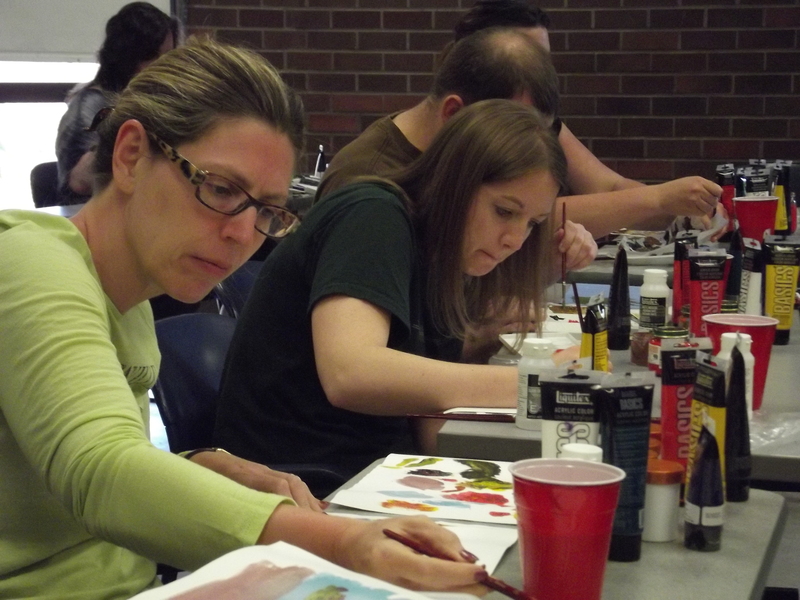 "In this hands-on class, students will learn how to work with water-mixable oils, using an easy step-by-step method. In this class, students will learn how to work with oils, using an easy step-by-step method that will have you falling in love with oils. You’ll learn how to paint some simple and easy shapes, how to mix and blend colors, and how to paint some easy landscape elements. About the materials: You can bring your own water-miscible oils, or buy a kit before the class. Please do NOT bring regular oils that need turpentine or solvents other than water to clean up. Water mixable oils only please. In this class you’ll learn to paint in oils. We’ll start by painting some simple forms and shapes, then add details to turn them into realistic objects. You’ll also gain a deeper understanding of color theory and relationships through a series of guided exercise, working with high quality materials. Why some color arrangements (or paintings) may look dull and bland, and how a small dash of a totally different color can bring them to life. No previous drawing or painting experience is needed.